Manufactured in the United Kingdom during the '80s. Apparently, Magnum Research were the importers.The gun is a pseudo CZ75 design with DA/SA trigger, inverted rails, frame mounted safety. The MC5 actually looks like a cross between a S&W Auto and a CZ75. The frame was made of alloy, but there was a stainless steel option. 3 barrel lengths were available in 4", 6", and 7.5" with porting also being available. 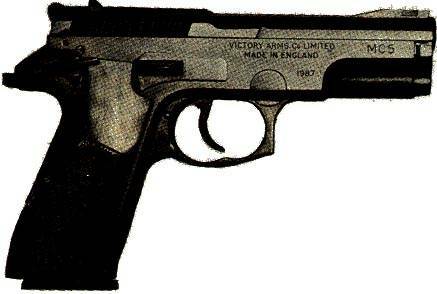 The VICTORY ARMS MC5 was manufactured in 4 calibers: .9x19 (with 4'' barrel and alloy frame), .45-Auto (with either 4'' or 6'' barrel and either alloy or stainless steel frame), .40-SW (same thing than the .45, but for the .40 there was also the 7.5'' and porting optional barrel available) and .10mm Auto (only stainless steel frame and either 6'' or 7.5'' barrel).